There are three types of economic indicators: leading, coincident and lagging. These indicator types are different based on how the data correlates with the overall economy. For example, a leading indicator is data that predicts how the economy will act in the future. 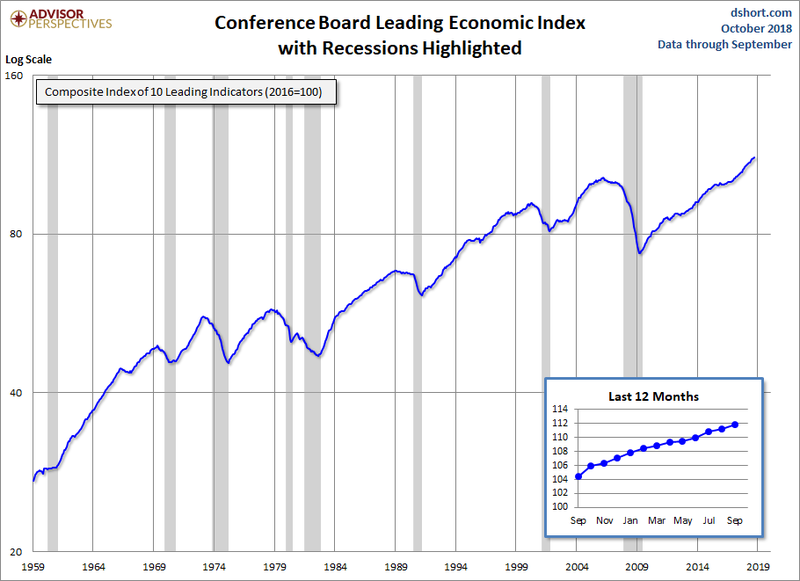 However, the Conference Board Leading Economic Index (LEI) in the chart below is made up of 10 different leading indicators. The index includes things like unemployment claims, building permits, new orders from consumer goods manufacturers and consumer expectations for business conditions. On the chart, you can see that before each recession, the index had topped out, and in most cases begun to fall. However, dating back to 1990, the peak of the LEI happened 17, 10 and 20 months before the recessions actually took place. In the 1990 and 2008 recessions, the market actually went 20% higher after the LEI topped out. You can also see that around late 2015/early 2016, it flattened out a little bit. During that time, there were two market corrections like the ones we’ve seen this year. There were some legitimate slowdowns in the economy at the time. But the LEI rebounded shortly after, and has been a straight line up ever since. The index has gone up every month of 2018 so far. This is a perfect example of how the stock market and the economy are two separate things. While the economy is driven by data and facts, stock prices are driven by emotion, whether good or bad. And right now, fear clearly has a strong grip on the overall market, as it’s in its second correction of 2018. It’s important to note that this index has signaled every recession since the 1960s. So, we shouldn’t see things start to deteriorate anytime soon. Plus, the index has historically given investors months to get out before the market goes south. So for now, the right call is to buy the current dip, and keep a close eye on this index.